Topic: Atmospheric plasma surface treatment of carbon-fiber reinforced plastic (CFRP) in aircraft construction prior to adhesive bonding and painting. 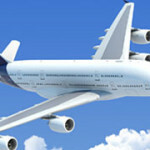 Aircraft construction has seen a fundamental shift in the materials used in that industry. In the past, aluminum alloys were used almost exclusively for aircraft outer skin and stringers. Today, these components are manufactured primarily from carbon-fibre reinforced plastic (CFRP).